But then Amazon kept helpfully suggesting this book every time I would log on. Hey, do you remember you looked at this book? Would you like to buy this book? What about more books on map making? I finally gave up and bought it. Because why not, right? So I didn’t have high hopes. I was wrong. Jared starts with a blank page and gives very simple instructions. Draw a blob. Anybody can draw a blob, right? Refine your blob with some wiggly outlines. Refine a bit more. Oh look, you got a continent. Draw a triangle. Draw more triangles. Draw some lines on the triangles. You got a mountain range. Draw some squiggles around your blob. Congratulations, here is an ocean. So behold, after much erasing and pencil sharpening and more erasing, my first attempt at a clumsy map. I took a picture with my phone. Then I messed with it in Photoshop. I used some free stock images from Pixabay for backgrounds. Things I’ve learned: I think I might get better results on a tablet. I am messy and the constant erasing resulted in some dark areas on the mountain range. I really would like to figure out if I can draw this on my iPad somehow. Also, next time I will leave naming of towns and town icons until the Photoshop stage. I am clearly not precise enough to not screw this up. Other than that, I had a ton of fun. 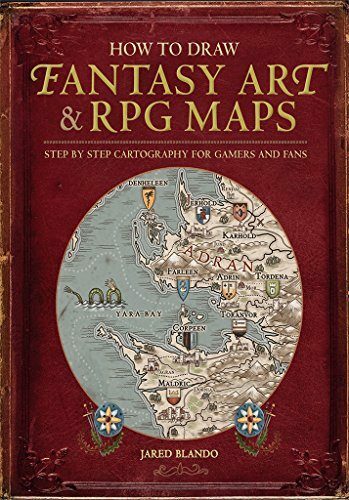 So if you are in the market for a fantasy map how-to book, this one is pretty awesome. I really like your map. Maybe I’ll put this book on my Christmas list. I think you did a great job with your map!! Better than I could do. Love your books! Thanks for sharing your talent and imagination with the rest of us!! 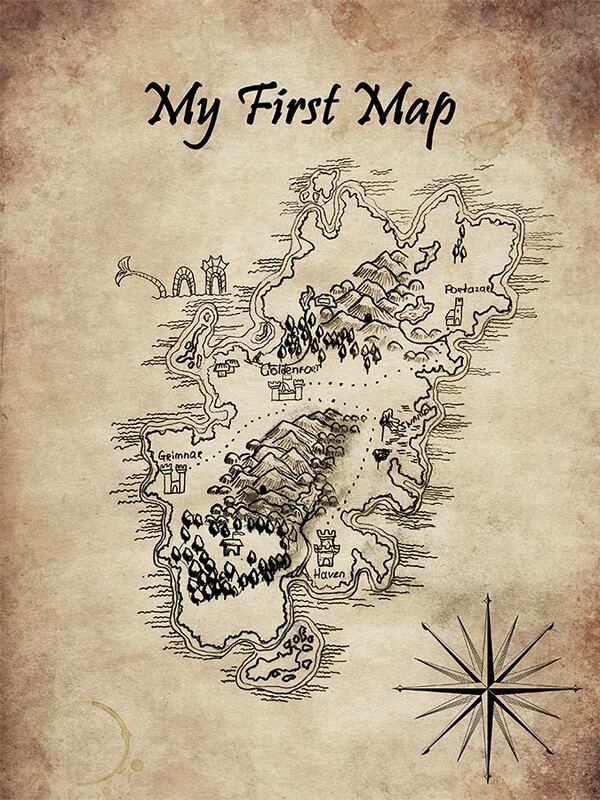 So love your map – really awesome. One thing (as a coastal geologist) – it can be really fun to look at fantasy maps and try to figure out how on earth those would come about (assuming geologic principles are the same on new planet) – https://mythcreants.com/blog/crafting-plausible-maps/. Honestly – it just means there are silly blogs where scientists try to recreate how that map can to be :). So feel free to completely ignore – just thought I would post a new rabbit hole to go down. That was a really fun rabbit hole! Thank you! The apple pencil and procreate are an awesome combination for drawing on the ipad. Procreate offers layers, you can download custom brushes, and export into a psd format if you prefer to use photoshop for touchups. The app Sketchbook is also nice, though I like Procreate more. The apple pencil itself is pressure sensitive, so it’s much better than a typical stylus when drawing, but pricey. The pencil and glass screen of the ipad make it a little too smooth, in my opinion. So I use a textured screen protector (iCarez makes a nice and cheap one) and it makes it feel like drawing on paper. Clip studio paint also recently came out with an ipad compatible app. I haven’t had a chance to try it yet, but their desktop version is awesome, and a really affordable photoshop alternative, so I’m sure their app version is similar. That is so great to know about the skin… I had had the same reaction, that the drag of the stylus is just too slick sometimes, and I miss the feel of a real pencil. (But really love the flexibility of the pen / layers.) Thank you! I loved this post. You did a fantastic job with your map. I teach a course on map making. Well, making a map of your own life. The map may include several geographical features that talk specifically about issues in one’s life like crossing the River of Despair. Climbing Mt. Healthy relationship etc. The book looks great and thank you Wendy W. for the website info. That sounds really interesting! 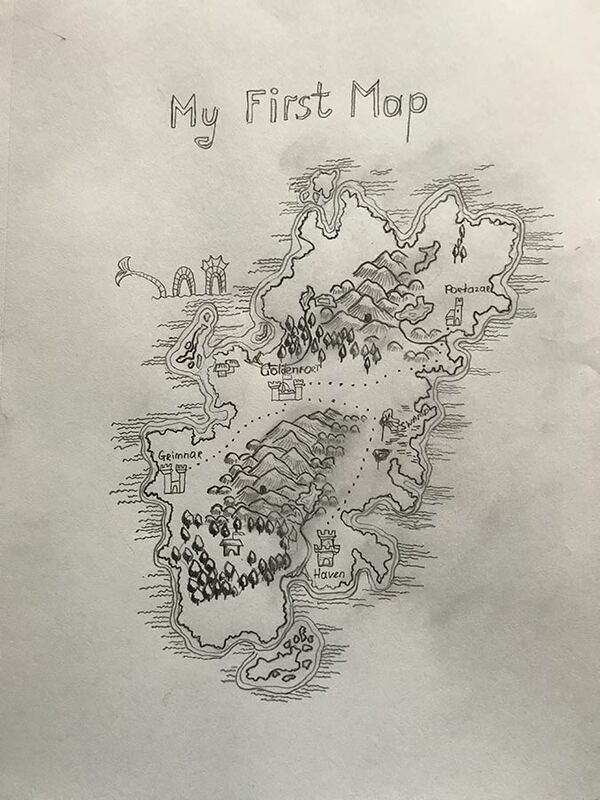 I’ve heard of life timelines used in therapy but never of maps, and crossing the River of Despair for instance sounds so whimsical and like a great way to come to terms with and organize one’s past. Your always great about sharing books, I just finished one you might like. It’s an unusual romance. Dustwalker by Tiffany Roberts. I borrowed it from unlimited but thinking about buying the book and audio to support the author, I liked it that much. I think the darkening of the mountains from your erasing actually makes them look good. Cool sounding book, I def want to check it out. 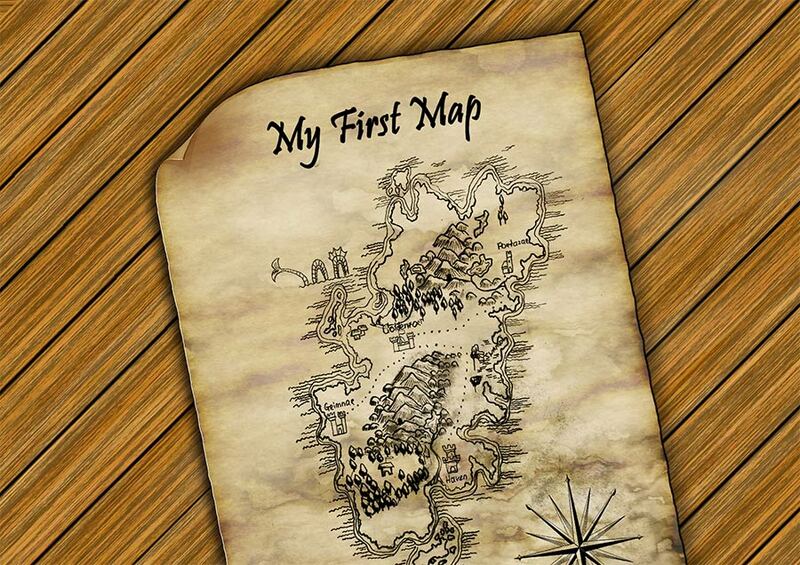 Very cool for a first attempt at a map! 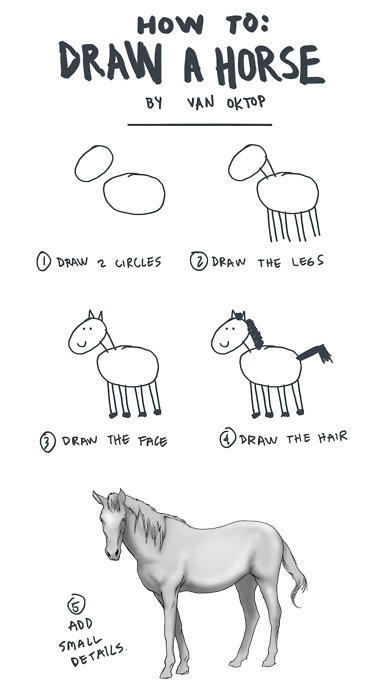 Skillful drawing is 95% practice anyway, so you are off to a great start. The map looks good. The eraser smudges seem like a map feature if you don’t tell us. I think it’s a very lovely map. Truly. And thou had fun? Win win! That’s totally impressive for a first attempt! I can draw on my ipad (pro, with the apple pen) pretty easily. I use procreate, and it lets me start from scratch or load a photo and then write on that. I use the photo option when posting about spinning or knitting. It took maybe 5 minutes to do total, after I spent half an hour or so dorking around with the app and how it all worked. I actually have this one! I just haven’t gotten around to doing anything with it just yet. I saw it was highly recommended also. I’m so glad it was useful for you. If you are looking at world building, may I offer a consideration? Look into basic weather patterns and geography to add realism. It will help bring with world building on knowing where the deserts, mountains ranges, rivers, and similar would go relative to each other. Your map looks great!! What a cool book; great recommendation. Sold! I’ve been looking for just this kind of book. Thanks for being the guinea pig and trying out the book’s instructions. I know what I’ll be doing during breaks from writing. Looks great! Adding it to the list for Christmas. 🙂 Thanks for sharing! Love the ostrich dragon. obviously below the wave is more interesting than above to a sea dragon! I like what you did whith te horse. The horse cracked me up. I’ve been looking for a decent drawing book for my grandkids and ran into the same problem with that last ‘little details’ step being way to vague. I will definitely check out the maps book as it seems a bit more useful. Thanks for the recommendation! The way I learned to draw the outlines for maps was with macaroni! Dump a handful on paper, shake it a bit, and using a marker, draw around it. Works great! Very well done! It looks fantastic, just like those I see in certain fantasy books.